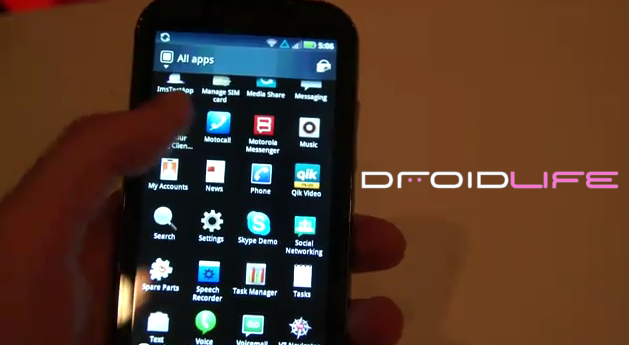 Motorola Messenger Coming with New Blur, BBM for Android? One of our amazing readers just pointed out the fact that there was an app called “Motorola Messenger” loaded onto the DROID BIONIC that we totally missed during our short-but-awesome time with the device at CES. Although we didn’t actually open it, we’re hoping that this is a Blackberry Messenger-styled app for Motorola devices. BBM has been one of the most missed apps for anyone switching over to Android, so it’s about time that one of the manufacturers attempted something like this. Of course the problem here is that it will likely only work with Moto devices, which means no chit-chatting with the Incredible friends. Check out the 28 second mark of our hands-on to see it. Oh, and you can also see it quickly during our hands-on with the GIANT BIONIC.